I’ve been reading a lot of reviews recently about the upcoming Banshee 1.0. 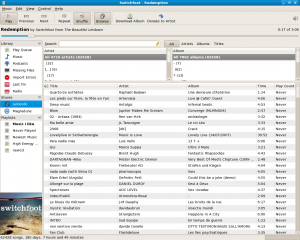 (Arstechnica and Linux Magazine, for example) It looks like it’s going to be an awesome release, but I wanted to see where it is now and compare that to Rhythmbox. 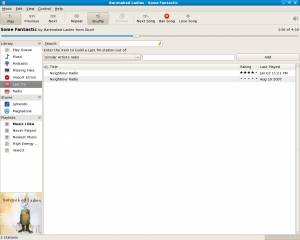 As I mentioned here, I switched to Rhythmbox in May 2007 (a year ago!) from Banshee which I had been using approximately from May 2006 (when Mono programs were first introduced into Fedora). Back then Banshee (and other Mono-based programs) were around version 0.1, but it was the new cool thing and everyone was talking about how awesome Mono would be for Linux. (This is before everyone turned against it and Miguel de Icaza) Eventually I left Banshee because it was slow and bloated (as are most Mono programs), couldn’t handle podcasts (which I had recently discovered), crashed when updating my large music library and when I changed Metadata it wouldn’t stay changed. Since then Rhythmbox has been meeting all of my needs. For Banshee to be worth switching to, it would have to provide all the features of Rhythmbox along with adding some new features. So let’s take a look, feature-by-feature and see how they stack up. For comparison purposes, I’m checking out Rhythmbox 0.11.3 vs Banshee 0.13.1 – these are the latest updated versions available in Fedora 8. First of all, apparently Banshee is not able to detect when I’ve added new music into my music folder. Both Rhythmbox and Amarok do this, so subtract points from Banshee from the start. First of all, from a user’s perspective, Rythmbox has nice, intuitive buttons. Text appears under each button letting the user know what it does. While no one will have any problems with Banshee’s play, forward and backwards buttons, I have no idea just by looking if it’s in random mode or in a mode to play straight through my music. Also, right off the bat we see that in this version of Banshee, although it can Scrobble my music, it does not appear to have any last.fm support built-in. 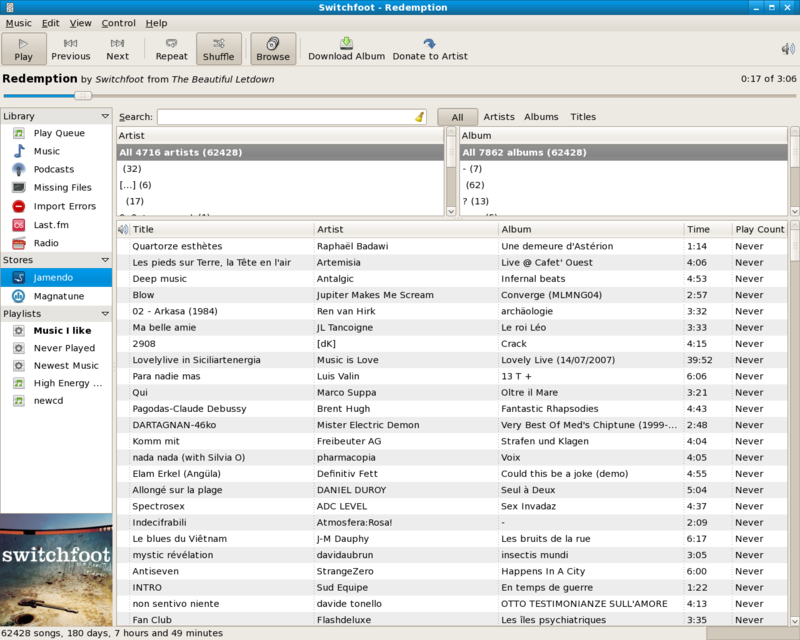 By contrast, Rhythmbox comes with Neighbor Radio and the ability to add more radio stations based on similar artist, artist, and tags. Very nice features. 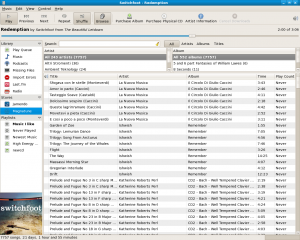 In addition to getting access to the Jamendo and Magnatunes catalogues for listening to, there are additional buttons added to the interface to facilitate the extra features of these services such as buying tracks or downloading albums. Looking at the radio selections, Banshee wins on the sheer number and variety of stations it provides “out of the box” so to speak. So I was just about to write off Banshee as a nice try, but something I’ll have to get back to when 1.0 finally comes out. Then I decided to play a song…. Here’s the kind of information being provided that makes me love Amarok! I’m not sure if this information comes from last.fm, but here I get similar artists, top songs and top albums by the same artist! Clicking on any of the songs from the top tracks switches over to that track. 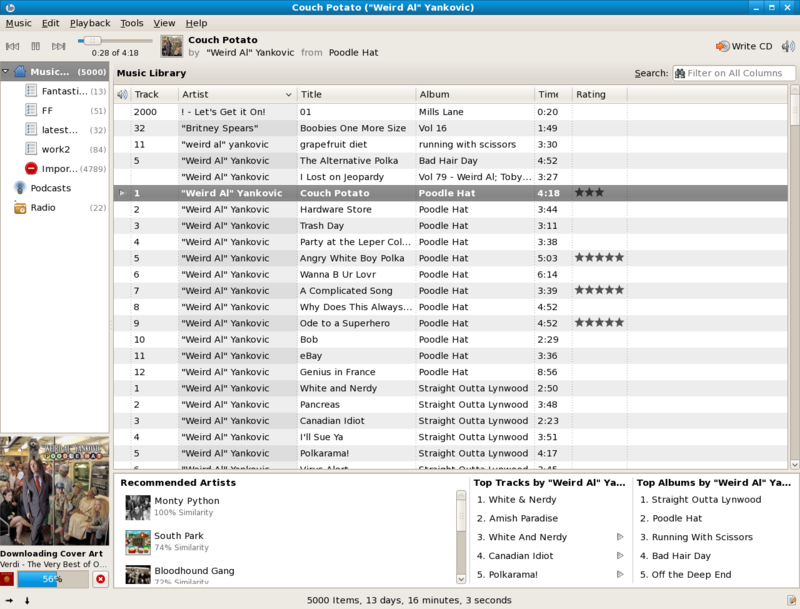 What I’d love would be the ability to use that to create a playlist. So instead of jumping to that song, I’d like to see it allow me to right click or middle-button click and get it added to a playlist. After waiting for the song to end so I could scrobble it, I clicked on the items and they take you to the corresponding page on last.fm – so that must be where the info comes from. I’d like to see that better integrated to include the functions I mentioned above. Final verdict? I think that Banshee has great promise to take over as my main audio program in the future. Features such as the last.fm integration I mentioned above are just the kind of extra info I expect to get if I’m going to run a music player more complicated than XMMS. 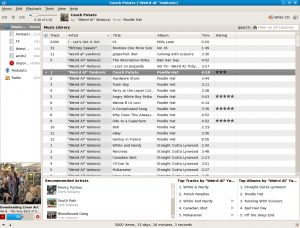 However, I’d like to see better integration with last.fm radio, Jamendo, Magnatunes, and any other such programs. I didn’t test podcasting since I have a ton of podcasts I’m currently following in Rhythmbox, but they appear to support it now. So I say stick with Rhytmbox for now if you want feature-completeness and keep a close eye on Banshee throughout the rest of 2008 to see what great suprises they have in store in 1.0. Of course, if you’re a Mono-hater, then you’ll be stuck with Rhytmbox, but I don’t see those guys laying down on the job and I expect the feature set to continue to grow and get better. Big Buck Bunny has been Released to the net! There are so many options, but I would also look at Exaile and Songbird. In Ubuntu sudo apt-get remove mono-common and all mono rubbish is gone. Songbird still has some work to go. I’ve used it on my Windows computer and it has a lot of promise, but still needs word. 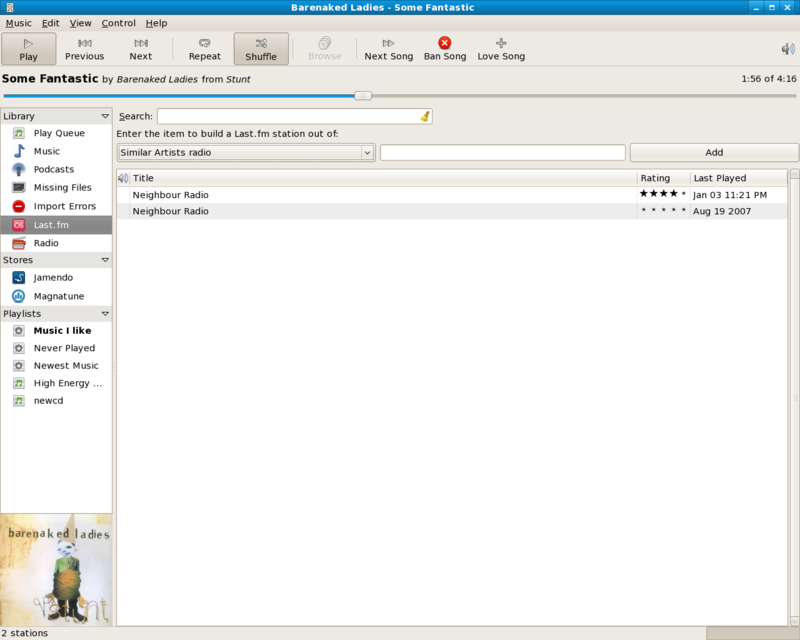 As far as Exaile – I was mostly focusing on the “official” Gnome music players.